There’s nothing like the smell of freshly baked bread to whet the appetite. So much healthier and more appetising than anything from the supermarket and infinitely more satisfying to have baked your own bread. Many people are daunted by the prospect of making their own bread believing it to be too technical and needing lots of special conditions. Our myth-busting Success with Bread class will show you how easy bread making really is. 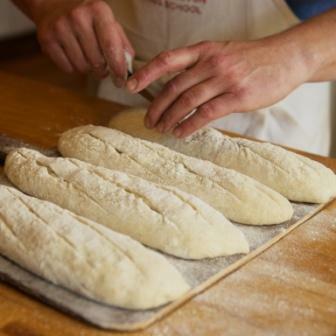 If you’re new to bread making or in need of a refresher this class will provide an excellent grounding in the essentials of kneading, proving, shaping and baking while we discuss how bread works and how you can make great bread time after time. 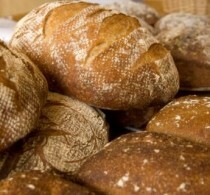 We’ll make beautiful white, seeded brown and enriched doughs and make a variety of great breads with them. You’ll go home brimming with confidence and a box of bloomers, flatbreads, seeded loaves and delicious, sweet buns. "Hi David, I just wanted to say thank you for a great days baking last Saturday. "Hi David, Thank you ever so much for the recipes and also for a most enjoyable bread class and stay. We had a great time and look forward to coming back to Manna in the future for another fun and tasty course!
" ... Anna, Gemma and Sarah.